Necessity may be the mother of invention, but absentmindedness spawns a few creations of its own. The legend of Gooey Butter Cake revolves around the latter, namely, a mistake that occurred in St. Louis during the 1930s. A German baker was preparing coffee cake when he added too much butter to the batter. Upon recognizing his mistake, the man might have started from scratch—were he baking during a different era. But this tale takes place during the Great Depression (although some alternative accounts place it slightly after, in the 1940s), and butter was an expensive commodity. Rather than toss the delicious accident, he sold it by the square. Decades later, locals are still buying it. St. Louisans loved the result so much that bakeshops all over the city began selling the same confection: butter, sugar, eggs, and cake flour poured over a chewy crust, then baked into a sheet with a crackly top. Recipes vary between homemade and bakery renditions, but they’re all decadent. 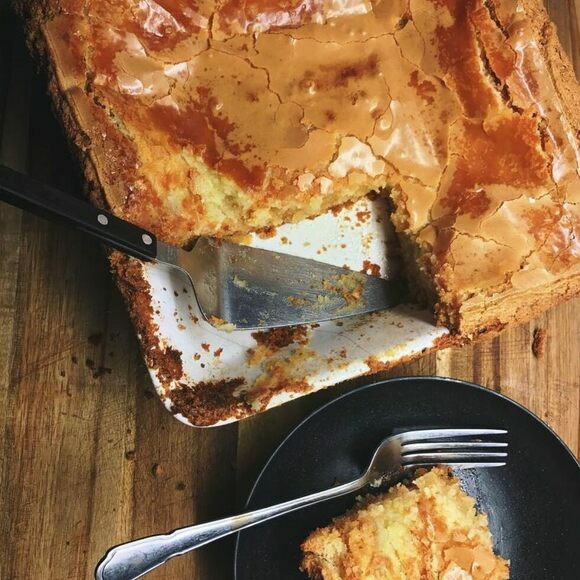 Today, Missourians often feature the sweet at holiday feasts, sometimes alongside pumpkin pie, sometimes in place of it: Pumpkin Gooey Butter Cake is one of the more popular variations. Outside St. Louis, you’ll be hard-pressed to find any kind of Gooey Butter Cake unless it’s coming straight from your oven. The dense, thick slice never acquired a fan base in other cities. However, national chain Jeni’s Ice Cream and New York’s Ample Hills Creamery both created popular flavors by churning chunks of the cake into their ice cream. Somehow, the frozen iterations are actually less indulgent than the plain cake that inspired them. Bakeries all over St. Louis sell this buttery dessert, but outside the city, your own kitchen might be the best bet. This bakery has been in operation for more than 50 years and is said to make a Gooey Butter Cake that's similar to the original recipe. Whole cakes sold to go. A variety of flavors (some seasonal) offered. They are closed Sunday and Monday.